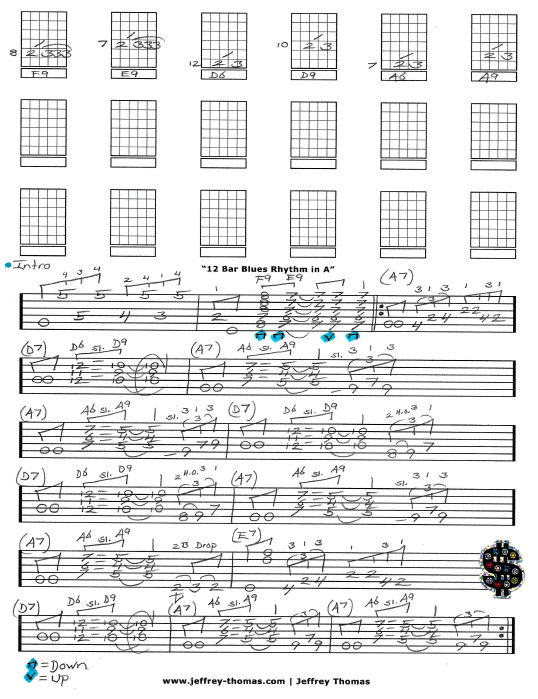 12 Bar Blues Rhythm in A Free Guitar Tab by Jeffrey Thomas. This free guitar tab includes a intro, chords and single note connections for blues in A. My video preview will review the full page and offer tips to help you advance your playing. I make sure to include focus on rhythm playing with all my students. Want the full guitar tab for free? Just send in your email address using the form provided. Looking for online blues guitar lessons? Fill out the Schedule A Free Lesson form to set up your free online guitar lesson with Jeff. Learn some great rhythm ideas with my free blues guitar tab! Find more great online guitar tabs on my blog, video and tab pages.